Turkish Coffee World offers a great line of authentic Turkish coffee supplies that help you make, serve and enjoy perfectly brewed Turkish coffee in your kitchen! If you’re new to Turkish coffee, let us give you a quick introduction. The process starts with very finely ground coffee, which is then mixed with water, sugar and spices, then boiled in a cezve, otherwise known as a Turkish coffee pot. The mixture will begin to froth and boil, at which point it’s poured into cups and served. The Turkish coffee tradition is a significant part of Turkish customs, and it’s enjoyed around the world! Turkish Coffee World makes beautiful and versatile Turkish coffee supplies that you can use to honor the centuries old tradition the right way. Because the grounds need to be extremely fine, most people use a Turkish hand coffee grinder. This brand’s version is great for fine grinding applications because it features a heavy-duty brass body and steel burrs that leave behind the perfect consistency for a traditional Turkish cup. 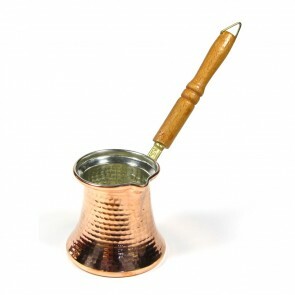 Turkish Coffee World also makes elegant copper Turkish coffee pots that make serving and sharing a total delight. We’d love to help you learn to love Turkish coffee with Turkish coffee World supplies here at Seattle Coffee Gear! Feel free to drop us a line with questions, and stop by our Blog and Coffee 101 pages for tons of great info on Turkish coffee and other coffee traditions around the world!